Staff Benda Bilili are a group of musicians whose home base was originally the Kinshasa zoo in the Democratic Republic of the Congo. They even rehearsed on the grounds of the zoo, until they were discovered by a Belgian record producer who got them a record deal. 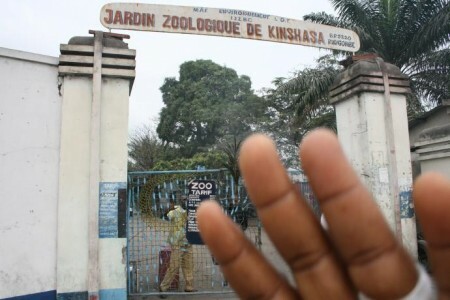 Their first album (Tres Tres Fort or “Very Very Strong”) was mostly recorded at the Kinshasa zoo as well. A documentary about the band—Benda Bilili!—premiered to standing ovations at Cannes last year (and is screening at the Walker September 22 at 7:30 pm, as part of Target Free Thursday Night), one of many recent success stories for the group, who play festivals and arenas now. 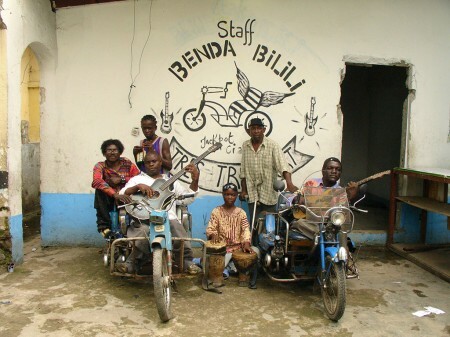 We might wish success for Staff Benda for another reason: four members of the band are paraplegic from polio bouts when they were younger, and they play their instruments from customized vehicles that look like tuk-tuks (wrong continent, I know) with vintage Harley handles. In other words, Staff Benda Bilili are some B.A. dudes. While affiliated with the Konono Nº1 crew, whose album Congotronics blew up in 2004, Staff Benda Bilili sound less like Konono’s junk-metal clang & roll and more like the warmer acoustic sounds of Buena Vista Social Club across the Atlantic. The Congo-Cuba connection has been widely explored in contemporary world music– Papa Noel (Congolese) and Papi Oviedo’s (Cuban) album Bana Congo one illustration of the fertile grounds for cross-pollination that exist–and we can hear these echoes in the music of Staff Benda Bilili. Staff Benda believe that “the only real handicaps are not in the body but in the mind.” Their deft songwriting on “Polio”—with the lyrics “Parents, please go to the vaccination center/Get your babies vaccinated against polio/Please save them from that curse”—wrap politics in a tenderness uncommon for musicians anywhere. Staff Benda consider themselves “journalists,” tapped into the events of everyday life. Their song “Let’s Go and Vote” was played repeatedly in the run-up to the 2006 DRC polls on radio and television stations; it was reported to be responsible for a 70% increase in voter turnout. “Benda Bilili” means “look beyond appearances” – literally: “put forward what is hidden.” Their show at the Cedar in September is sure to be raucous, heartfelt, and virtuosic. Like Buena Vista Social Club, Staff Benda are a class act.